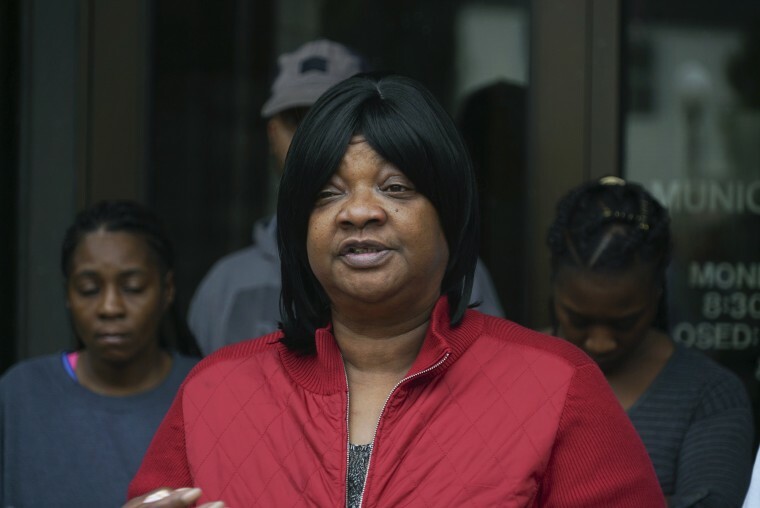 EUCLID, Ohio — The family of an unarmed black man fatally shot by a white policeman has filed a federal civil rights lawsuit. The lawsuit, which was filed Monday, alleges that Euclid is responsible for practices that led to Officer Matthew Rhodes shooting and killing 23-year-old Luke Stewart in March. Rhodes was responding to a report of a suspicious vehicle in Euclid, in suburban Cleveland, when he encountered Stewart sleeping behind the wheel, startling him awake. Rhodes said he opened the passenger door and reached into Stewart’s car to try to push him out when Stewart turned the ignition and started to drive away, prompting Rhodes to jump in. Rhodes said he struggled with Stewart to control the moving car and then shot Stewart because he feared Stewart would crash the car. The lawsuit comes as activists have been criticizing Euclid police for an arrest in which a white officer with a history of disciplinary issues was caught on video punching a black man more than a dozen times in an August traffic stop. Stewart’s shooting and the August arrest have prompted other people to step forward to complain about police abuse, inflaming racial tensions in the city, which is about 46 percent white and 54 percent black, according to the 2010 census, the most recent figures available. The lawsuit alleges that the police violated Stewart’s constitutional rights to due process and protection against unreasonable seizure and that police failed to appropriately investigate and discipline Rhodes or his partner. It seeks reforms in the Euclid police, singling out a “code of silence” it says “institutionalize(s) police lying and immunize(s) police officers from discipline.” It also seeks financial compensation for the death of Stewart, who left behind two children. Euclid police and Rhodes didn’t immediately respond to calls and emails seeking comment Monday. The president of Euclid’s police union says he has to review the lawsuit before commenting. Euclid placed Rhodes on paid leave following the shooting and put him back on duty in March. A grand jury heard evidence from prosecutors with the state attorney general’s office and then declined to indict Rhodes in August, closing his criminal investigation.